Me? A Princess? Shut Up! 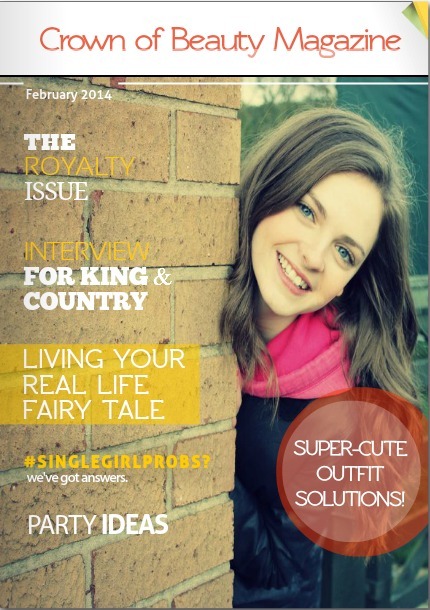 Check out more princess-inspired articles like this one in the Royalty Issue! I’m sure you’re familiar with the tale. 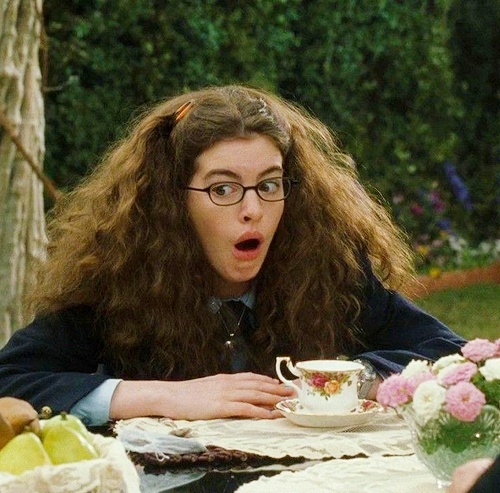 Mia Thermopolis is a fifteen-year-old, socially-awkward teenager who can't see much past her bushy eyebrows. Her life consists of scootering up the hilly Los Angeles terrain with her best friend Lily, and crushing on the hunky High School jock who doesn't know she exists. Her drab existance in the suffocating halls of High School are all she's ever known. One day her long lost, British-Tea-Drinking Grandmother arrives and reveals the deeply-hidden family secret. Mia’s late father was king of a small European country. That means Mia is a Princess and will inherit the throne. Her reaction is like a classic Hallmark moment. Can you imagine the horror? Mia frequently threw up in Speech class, got sat on by other classmates, and tripped on thin air. Not much princess potentail there! The writers for this movie script must have had a fun time painting the contrast between Mia's life and the idea of what princess life should look like. By the time the final credits of this movie roll, I have laughed, cried and cheered Mia on. Every time, I watch in amazement as she is transformed into a woman who learned to use her voice, walk with confidence (well, most of the time) and fearlessly (or not so fearlessly) step into the role she had been called to. This movie always inspires me. Mia is the type of princess I want to run up to and give a big old hug, shouting, “Thank you for being real!” There's nothing movie star glamorous or polished and fake about this princess. 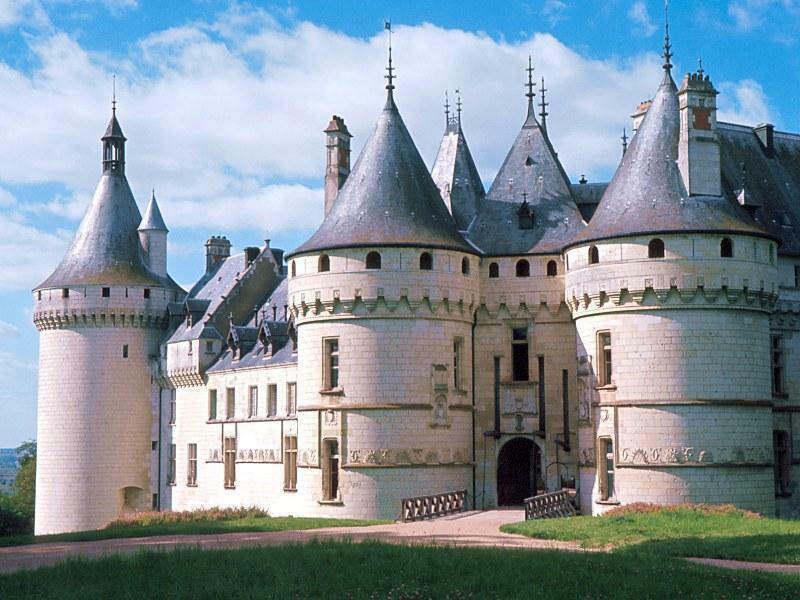 She didn't grow up in a whimsical castle, or have a long line of men waiting to court her in the parlor. I relate with the girl who trips and slams bottom first onto the bleachers, much more than I care to admit! I suppose the reason why Mia is such a treasured character to me, is because royalty is my reality. Yeah, you heard me right. 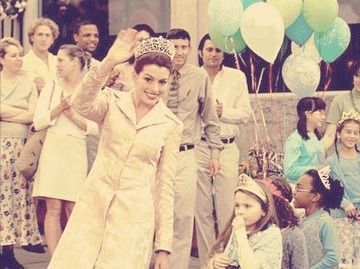 I’m an undercover Princess. I might wear a pair of casual bluejeans, sneakers, and a messy pony-tail, but beneath it all ... 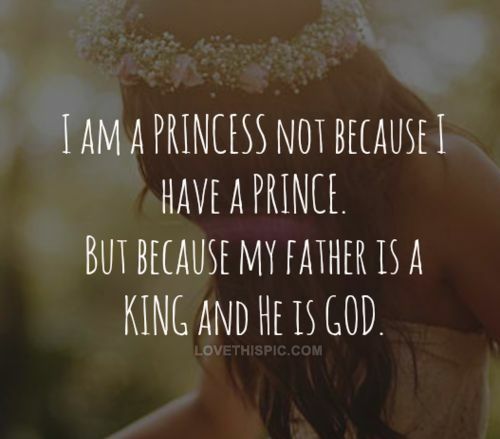 I am a daughter of the King. My life is skillfully being woven together into the most exciting saga, as the Grand Author and Storyteller is magically pulling it all together. This open invitation was the start of a magnificent journey. I believed in the One who breathed life into me, therefore I was given the right to become royalty. I was a spiritual orphan rescued from a terrible fate. The punishment of Hell and torment, because I had broken so many of the Kingdom's rules, was hanging over my head like a storm cloud. My dark surroundings and hidden sins clung to me like a heavy fog, until the day a glorious light broke in. The shining Prince, the Light of the World, Jesus Christ, rode into my life and transported me into a fairy-tale. But just like Mia's story, my life didn't radically change overnight. Me being royalty didn't instantally give me a car, a job, or a boyfriend. It didn't make me stunning and successful in the eyes of this world. In fact, it would be easy for an untrained eye to pass me by and not see a princess standing there. My surroundings and life situation were still the same. I still had struggles, hurts, fears and tribulations. But something did change. I had an identity switch. The nature of my heart, and the very blood cursing through my veins was washed with the divine blood of Christ. My entire DNA had changed! When I said, “Yes” to this royal invitation, the heavens started to buzz with activity. I became a citizen of Heaven. I now have an address in a city where the streets are paved with gold. No city on earth could match its unfathomable wealth, because it is the dwelling place of my royal Father. As a legal citizen from this upper class society, I have a rank and social status that none can match…Daughter of the King. I have a glorious bedroom waiting for me in the King’s castle. Mia had to wait several years before she saw her regal bedroom suite. The same is true for me. I've never seen the room before…in fact, I've never been to my homeland. I can only imagine what my Heavenly bedroom looks like. Is it nestled high in a tower? Does it have an indoor waterfall and stream that flows through from the Crystal Sea? As a temporary visitor on this earth, I'm currently lodging in a humble home tucked off the highway. My surroundings are anything but glamorous. 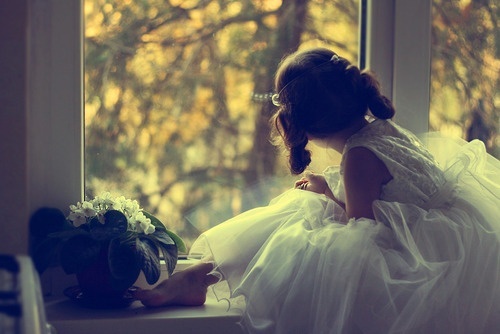 Sometimes, on my bad days, when the sky is overcast and circumstances are dreary, I grow very anxious about my future. I know that I am guaranteed a happily ever after, and an eternal place in my Father's house...but what happens until then? It's tempting at times, to shed my royalty identity and settle into the rhythm of an average American teenage girl. This earthly culture flashes glamorous images of fame, wealth and beauty. Sometimes I desire to chase their definition of worldly success. My royalty identity is something unseen and it doesn't gain me much applause or affirmation from the world. Sometimes, I wish I could simply slip on a wig like Hannah Montana, and conform to my jaded surroundings, just like a chameleon. It certainly would be easier. Grandmother Clarisse didn't force Mia into the job. But if she refused to take the crown, someone else would. There was a usurper lurking in the shadows, hoping to pounce on the power. (Mr. and Mrs. Barren. Remember the postage-stamp nose lady?) The same is true of us, if we abandon our royal crown, there is an enemy waiting to take possession of it. Just like Mia, we have a choice to make. Will we take a step of faith toward our royal calling and receive the invitation into the King's courts? Or will we shrink back in fear with inadequate feelings of hopelessness, settling for our drab Americanized lives? Boldly choosing to respond to our call as Daughters of the King will powerfully influence the lives of those around us. When we seek the Kingdom of Heaven and the One who rules, ask to learn His secrets, and live according to His royal law on the earth, we get to partner with Christ and live out the most amazing, exhilarating, epic, story ever told! If you feel like you've been cheated, lied to, and have walked in anything less than the fullness of who you were created to be...that's because you were. The enemy knows you were created for royal greatness, and he has tried to keep you from understanding that. But now is the time to rejoice! Get excited and determined! You are no longer ignorant to this call of brilliant greatness on your life! If you partner with Christ to pursue His heart and His Kingdom...you will be unstoppable! A) Choosing to seek the world and all its flashy, neon-light pleasures for fulfillment, rather than God. B) Being ignorant of what we've been given in Christ, and of our royal identity. C) Falling in love with this culture, subscribing to their ideals, and conforming to the world around us. carrying the name of Christ and the desires of my Father, am I willing to suffer temporary stings like persecution, discomfort, and people rolling their eyes behind my back? Am I willing to stand up against the voices that say, “Why don’t you just do things our way?” Or do I care more about what man thinks of me, then pleasing the King? Refusing to live out the call as His Royal Ones and powerfully influence this earth, makes us terrible stewards of what we've been given. I often forget who I am and who God is in my life. When distractions enrapture my heart, I forget about the unseen Kingdom that I have been called to. One way that I manage do to this quite brilliantly is through worrying. Majoring on the seen and obsessing over uncontrollable details such as what my future holds, finances, who I'll be marrying, the next book I'll write, if people like me or not, and if my ministry will be effective, etc. Quite often I take a microscope and examine my life. I start biting my nails. Too bad that just like Mia, sometimes I can't see past my big bushy eyebrows of worry. I need to spend more time looking at the unseen, so that I do not forget who God is, what He has planned, and who I am in Christ! Often I need to remind myself of His unbridled goodness, and direct my eyes upward. Just look at all the Father has given us! We have a 24/7, all-access backstage pass into the very throne room of God! We can enter any time we need, crawl up on his lap, and ask Him anything. We have His undivided attention. How often do we spend time seeking His kingdom? What does that even look like? To seek the Kingdom is to seek the King. Jesus is the heartbeat of the Kingdom. He has so much to reveal about who He is, who we are in Him, and what He desires to do on the earth. As His royal ones, we must take time out of our busy schedules to incline our ears and ask what He desires to speak to our hearts. I cannot think of a better place to begin pursuing the King and responding to His invitation, than to dive into His Word! Jesus is the Word (John 1:14), His Word is alive and active (Hebrews 4:12), and He wants to speak to us today! Thank You for sending your Son Jesus, so that I could be forgiven of sin, and adopted into your royal family. Thank You for specifically creating me to be a Princess and to partner with Christ as a Royal Citizen of Heaven! It blows my mind. Reveal more to my heart about this truth. Use this time of prayer and reading your Word to speak to me. Show me what it means to be your royal daughter. Strengthen me to pursue You and Your Kingdom. Teach me Holy Spirit! Worrying is one of the worst things a princess can do. It displays distrust in the Father and tells Him where our faith really lies...in ourselves and what we can control. Read these verses about worrying & ask the Lord to help you trust Him. Check out: Matthew 6: 25-34, Psalm 37:1-8, Philippians 4:4-7. 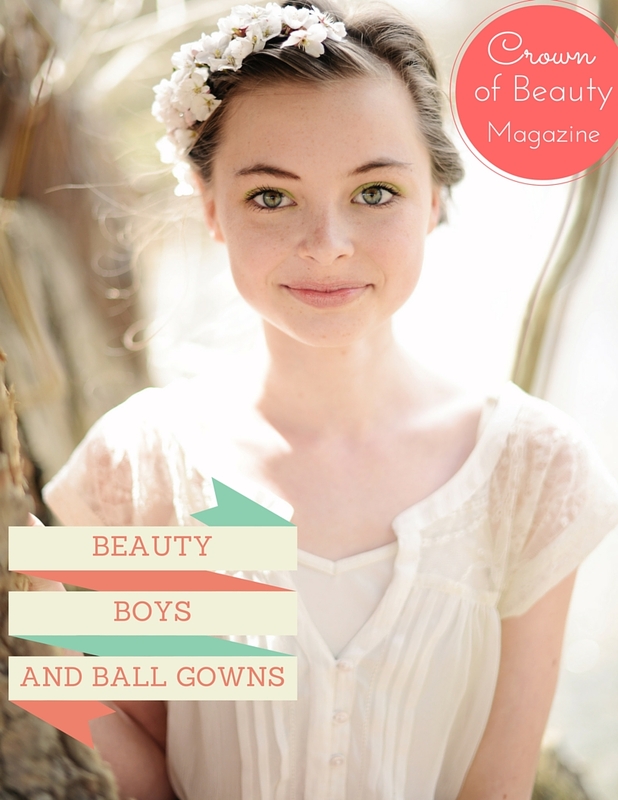 Beauty, Boys and Ball Gowns!